This is the campaign page for our fight to return the coastline to public ownership. If you would like to help fund this campaign, please click HERE. With every square inch of our whole coast – right out to the edge of the Territorial Sea – claimed many times over and the settlement process for claims being increasingly tilted in favour of claimants, there is a very good chance that much of the coast could end up in tribal hands. It was never the intention of Parliament to place the future of the whole of New Zealand’s coastline in the hands of Judges, yet that is what has happened. It is therefore time to call for a return of the coast to public ownership. To do that,we need your help. This paper provide an excellent summary of the claims process and outlines exactly where the eight priority claims that are expected to be the first ones to be determined in the High Court are located. It also outlines the priority claims that have been identified for the Crown Engagement process. 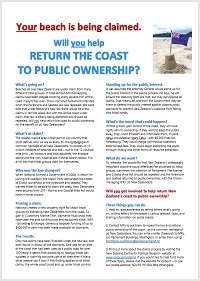 We are distributing a flyer to coastal households over the summer, as many New Zealanders are not aware that the claims process is underway and that their beach is under threat. Please click the image to view. If we gain sufficient support, this will be a three stage campaign. The first stage is this ‘information’ flyer. The second stage will involve a flier that is harder hitting. And the third stage will involve a stronger call for action through newspaper advertisements. And please don’t forget that if you would like to help fund these flyers – the details are HERE. Firstly, two claims have already been settled – one in the High Court HERE, and one through Crown Engagement HERE – and both were found in favour of the claimants, who were awarded Customary Marine Titles. 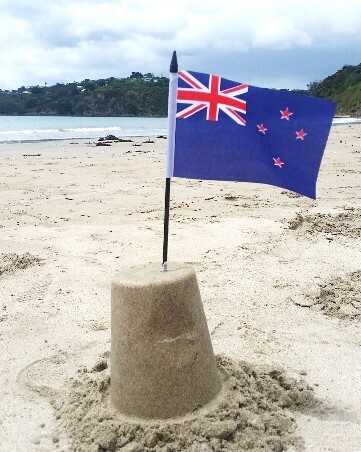 You can read our concerns about National’s proposed law change in a 2010 article Maori Ownership of the Foreshore and Seabed HERE – these concerns are now becoming a reality. A recent NZCPR article outlining what’s going on is HERE and Dr Hugh Barr’s article is HERE. The “Archive” link on the top navigation bar of our website will enable you to browse a wealth of articles about this scandal – alternatively, you can type “foreshore” into our website search function. Maori claimants can receive over $400,000 in taxpayer assistance to prepare their claims, while those opposing them have to pay $110 to the High Court for each claim. Over 200 claims that have been lodged. Following is a comprehensive resource of information on the Marine and Coastal Area Act claims process. Please note that if the links appear problematic – try changing browser to Chrome or Explorer. Click the link to the maps and find the map that covers your area of interest (we have provided a link to Google maps to help since the maps do not have place-names on them). Also note, if you click the claims Map you are interested in and click it again, it will be magnified..
Identify the number of the claim that covers your area of interest then download the High Court spreadsheet (as outlined in orange above), which allows you to cross reference the map number with the actual application lodged in the High Court. The High Court case number (CIV number) is the key identifying factor for each claim. We would like to encourage everyone who is interested in helping to oppose these coastal claims to register their interest in the form below. Our aim is to ensure that whenever a coastal claim is being considered by the Court or the Minister, locals will be able to help to counter any misrepresentations. When you fill in the form, if you have concerns about particular coastal areas, please let us know, and if you have historical evidence that you feel will be useful in refuting opportunistic claims, please share that as well. Further, please help to spread the message by letting everyone who is concerned about these claims know that they can help to oppose them by registering their interest here. Thanks for your interest – we will be in touch soon. And if you would like to email us, the address is claims@nzcpr.com.